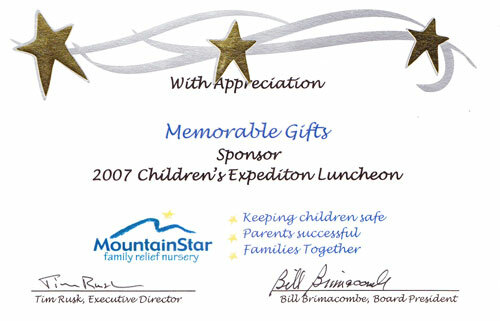 Thank you for Memorable Gifts.com, Inc. sponsorship of the MountainStar Family Relief Nursery 2007 Children’s Expedition Luncheon on October 11, 2007. Because of the wonderful outpouring of support from the community, MountainStar has been able to enhance our ability to provide services to the most vulnerable children in Deschutes County. 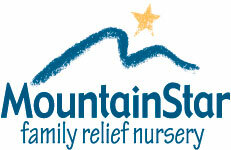 MountainStar continues its pattern of growth and development, so that more children at-rise can be identified and served. We are the only agency in the region providing comprehensive services targeted at preventing abuse and neglect for families with children birth through 3 years old, families who typically remain invisible until the children enter the public school system. Our goal is to support these parents and children during this crucial time for a child’s development, and help avert the harmful consequences for children living in a high-risk home environment. We thank you for joining in this effort and sharing our vision of striving to keep parents safe, parents successful and families together.